"Approach virtues as a state, not a personal trait"
Association for Moral Education Conference in Barcelona, Spain, where she presented a paper on a new online questionnaire she developed which allows participants to evaluate themselves in order to support their own moral growth. Theunissen, a Dutch scientist and entrepreneur, is the founder of Future Life Research, a social enterprise which focuses on innovation for the future. It developed the questionnaire, the Virtual Mirror, which can be found on the website www.mijndeugden.nl. The organisation has made it its mission to double positive behaviour worldwide by 2030. At the conference Theunissen gave insight on the ideas behind developing the questionnaire. The portal www.mijndeugden.nl - which translates as "My Virtues" - provides online coaching with positive practical assignments. "It is based on the classical knowledge of virtues and strengthened with contemporary psychological and educational insights. 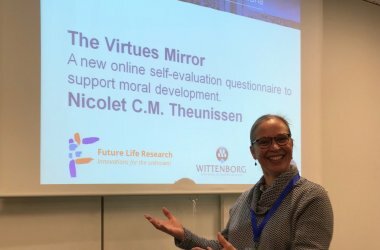 The Virtues Mirror helps individuals to reflect on their virtuous behaviour," Theunissen told attendees. require a synthesis: a balance between virtues to ensure balance in behaviour. Together they form a moral compass during everyday moral dilemmas, and can be put into practice when needed. They give expression to universal values desired by every society, and let people and societies flourish." According to Theunissen, the Virtues Mirror approaches virtues as state (not a trait) to promote the practising of virtues. It is created according to social sciences standards in questionnaire construction, is user-friendly and easy worded. "This helps to increase the motivation for repeated use."